Brazilians like to make this delicious version of "french toast" at Christmas, but rabanadas are delicious any time of year. The recipe for rabanadas migrated to Brazil from Portugal. Rabanadas are very similar to Spanish torrijas, which are typically eaten during Semana Santa (Holy Week) in Spain. Rabanadas are so popular in Brazil and so traditional for Christmas, that during the holidays you can buy special bread - pan de rabanada - just for making them. Rabanadas differ from American French toast in several ways (though both are a great way to use up stale bread). Rabanadas are commonly enjoyed as a dessert or afternoon treat, rather than as a breakfast food. The bread is soaked in milk and/or wine, dipped in egg, and then deep-fried in oil. In Spain, they use olive oil for this, which is especially good. 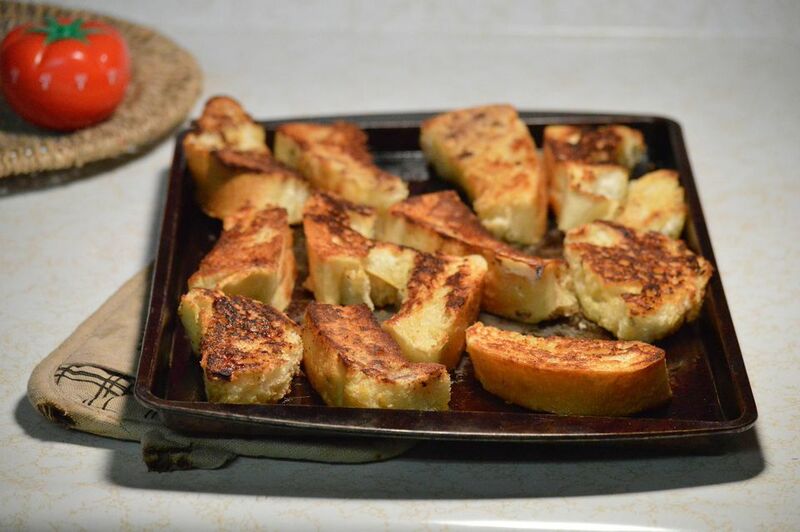 The resulting "toasts" have crispy exteriors and are soft and custard-like on the inside. Slice the bread into about 16 slices, each about 3/4 inch thick and ideally oval or round in shape. Place the bread slices in a shallow baking dish, in one layer if possible. If the bread is not very stale let the sliced bread dry out in the open air overnight if possible. Place the milk (and/or wine), cinnamon sticks, 1/2 cup sugar, and pinch of salt in a pot over medium heat. Bring mixture to a boil and let the mixture simmer for 1 to 2 minutes. Remove from heat and let cool. Remove cinnamon sticks. Pour milk mixture over the sliced bread, distributing the liquid evenly over all of the pieces. Let bread soak for 20 to 30 minutes, allowing it to soak up as much of the milk as possible. Heat a couple of inches of olive oil in a large heavy skillet until oil is hot enough that it sizzles gently when a piece of bread is adding to it. Cover a large plate with a layer of paper towels. Whisk the eggs together in a medium bowl until very well mixed. Use tongs to pick up a piece of the milk-soaked bread (handling it gently) and dip it into the egg, coating both sides with egg, and allowing the excess to drip back into the bowl. Place the bread into the oil, and cook until well-browned on one side. Flip the bread and cook until both sides are golden brown, then​ carefully transfer rabanada to the plate lined with paper towels. Repeat with remaining slices of bread, cooking several simultaneously if the skillet is large enough. Mix the cinnamon with 3/4 cup sugar and sprinkle mixture over both sides of the cooked rabanadas. If you would like to also coat the rabanadas with a sugar syrup, heat equal parts honey or maple syrup with water and quickly dip each pastry into the hot sugar syrup. Serve rabanadas warm or at room temperature with extra honey. Rabanadas are usually sprinkled with cinnamon sugar, but can also be coated with honey or sugar syrup (like croissants). Breads like brioche, challah, and rosca de reyes work especially well for this recipe, but French baguettes or Italian bread work well too. The bread should be stale and dry so that it doesn't fall apart after soaking up the liquids.